This is a combination High School Regulation Soccer Goal (8'H x 24'W x 3'D) and High School Regulation Football Goal (10'H x 23'4"W), it's all aluminum construction, includes ground sleeves and ground caps. 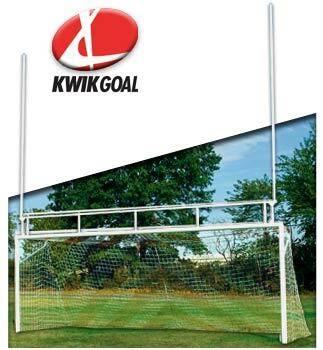 It has a 4-3/8" round front posts and crossbar along with it's detachable football uprights make this rugged dual purpose goal extremely budget friendly. Can be installed either permanently or semi-permanently. White polymer coated. Meets ASTM provisional standards PS 75-99.